Chemotaxonomy is a classification method based on the comparison of similarities of natural compounds among the organisms to be classified. However, it presents some difficulties because the chemical compounds present large variability. Currently, different classification methods are available in chemotaxonomy involving classical and modern taxonomy. Asteraceae is one of the largest families of angiosperms, and its sesquiterpene lactones are considered important taxonomic markers. They have been studied as promising new drug sources as a consequence of their enormous pharmacological potential. With regard to modern methods to study taxonomy, in the last two decades, linear approaches such as principal component analysis and partial least squares as well as other machine learning methods like artificial neural networks, k-nearest neighbors, and self-organizing maps have been used as pattern recognition methods to study the distribution of sesquiterpene lactones among the tribes and genera of Asteraceae. For this purpose, thousands of chemical structures and molecular descriptors that encode different physicochemical features of compounds have been used. Such studies are empowered by computational methods and databases of secondary metabolites. 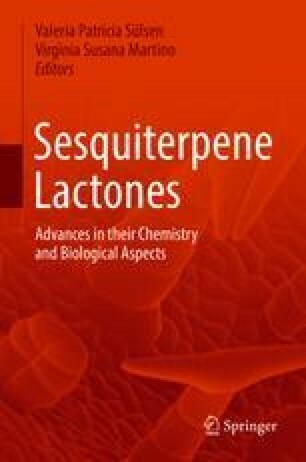 In this sense, systems that are able to manage large databases of sesquiterpene lactones are crucial for more robust chemotaxonomic studies of Asteraceae. The web tool AsterDB (www.asterbiochem.org/asterdb) is an interesting database with a friendly interface that contains thousands of chemical structures of secondary metabolites from this family and comprises more than 1000 chemical structures of sesquiterpene lactones. The great evolution in the study of natural products based on computational methods shows that modern and integrated platforms will be available soon for several purposes.